I suspect a first preview of next week’s Shadowland will be posted somewhere on the Internet within the next 48 hours, but in the mean time, we’re still in the dark. In fact, things have been eerily quiet on the shadowy front since the last of the teaser images were posted and the September solicits were released. I’ve had an unusually busy last couple of weeks, so from a news reporting perspective, that’s been fine by me. (Ironically, the minute I wrote this, Daredevil editor Stephen Wacker posted this page of preview art from Shadowland: Bullseye on Twitter). However, a lack of news is no excuse to forgo looking back at what we do know, or at least what we think we know. In this post, I will post select quotes from interviews from the last few months, as well as other sources. Whenever something makes me stop and think, I’ll be sure to throw my two cents in, and invite you to do the same in the comments. Anyone who thinks Matt will kill Bullseye, raise a hand! Seriously, if it’s not him, it’s bound to be someone else. It’s the logical choice for a creator to make if he wants to push Matt over that line he’s been skirting the edges of for years now. So, what’s this? Bullseye doesn’t die? Or does he? I’ve mentioned before how much I’m looking forward to this one-shot. Matt and Elektra teaming up is sure to be twisted. Make it good for me, Mr. Wells! We all know the comic book companies are like gossip magazines when it comes to teasers like these. You read about someone having to say good-bye to “their favorite girl” only to find out it’s about the celebrity in question having to leave their dog behind when moving. What does worry me is that famous comic book characters often die. Now, they don’t necessarily stay dead, but I’m not a big fan of either scenario. Personally, I hope “better place” = “mental institution” (heck, he’s already been to jail…). I didn’t immediately think Matt would die when I read what Wacker said (“…But at least Matt will be in a better place”), but it has occurred to me before that they just might kill him in Shadowland. If so, who would be the one to deliver the fatal blow? They are heavily suggesting DD will kill Bullseye, but that could be a ruse, and it could be Bullseye who finally gets his target by the end of this story. I don’t think so though. 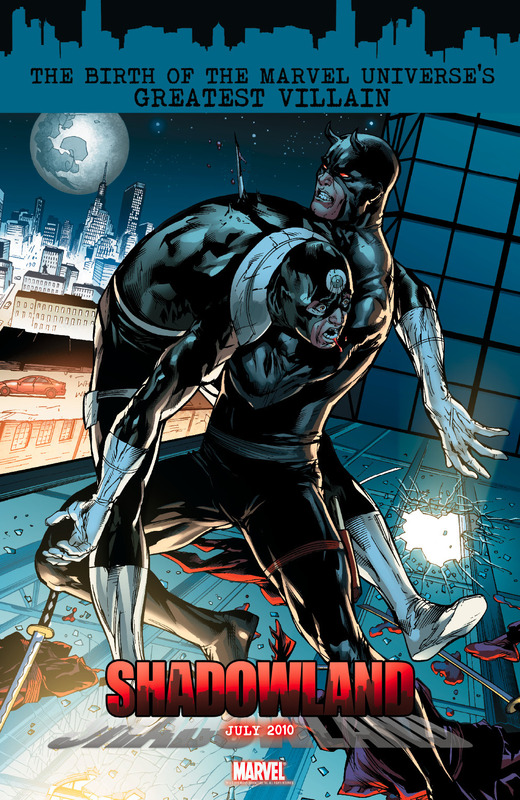 I think it is more likely that Matt does kill Bullseye, even if committing murder is so unlike him. If anyone could make DD want to kill (or feel the need to kill) it is Bullseye, and Matt hasn’t exactly been himself lately. Even though I am certainly excited for Shadowland I find myself also feeling some trepidation as we get closer. 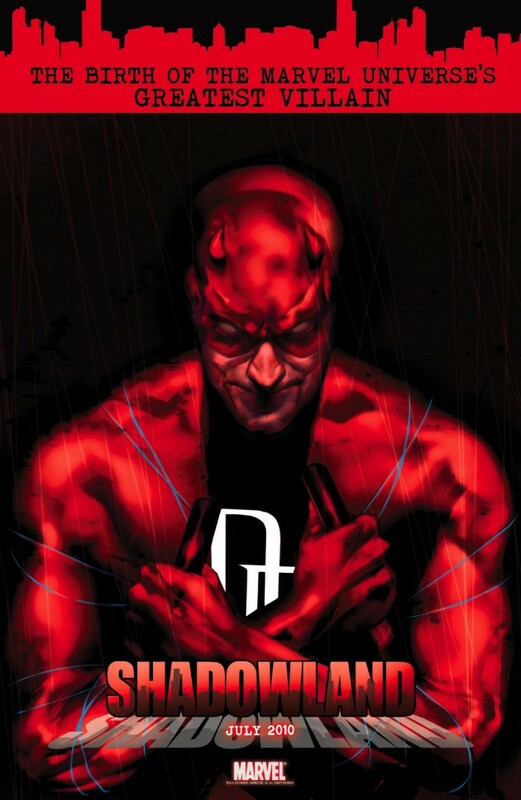 I’m almost afraid of what the repercussions of all of this are going to be for Daredevil. I hope Matt doesn’t just kill Bullseye … or anyone else for that matter. The bending of Matt psyche is what makes him great … breaking him would in it’s own way be a cop out. I’m also not sure I would be on board with the inevitable story on his “redemption” after the fact story ether. Having said that this creative team has surprised me and shown profound respect for the character and his canon (love me some Snakeroot). DD’s my hero guys! Don’t let me down! Thus far, the teasers seem to be spoilers. I wasn’t surprised by anything in Shadowland #1. I sort of feel as if I’ve been gypped. Creators always (disapprovingly) wonder why people flip to the final page of an issue to see the big reveal before they buy it, yet the publisher finds it appropriate to release the final page and half of the splash pages as teasers?! Mental. I hope this is all a sleight of hand, because I really want to enjoy this event. Well, I think the point of having many teasers is that readers will find out that some of them “come true” whereas others don’t. With the teasers we’ve seen so far, some even contradict each other. There weren’t that many surprises in Shadowland #1, but I found myself enjoying it nonetheless. I just wish they wouldn’t use actual interior art as teasers. Especially the final page of an issue. I totally agree with that, especially since those two pages were a couple of my least favorite examples of Billy Tan’s work for that issue. The backlit black Daredevil looks like a Doberman and Bullseye’s body and face are really odd looking for the final scene. They should have used original art, definitely.